Keep mosquito populations to a minimum. Drain water from toys, buckets or any object that can hold water and serve as a breeding ground for mosquitoes. Change the water in birdbaths several times a week. Toss a Mosquito Dunk (SummitResponsibleSolutions.com) in rain barrels and water features. This organic insecticide only kills the larvae of mosquitoes, black flies and fungus gnats. It won’t harm bees, butterflies, birds, pets and people. 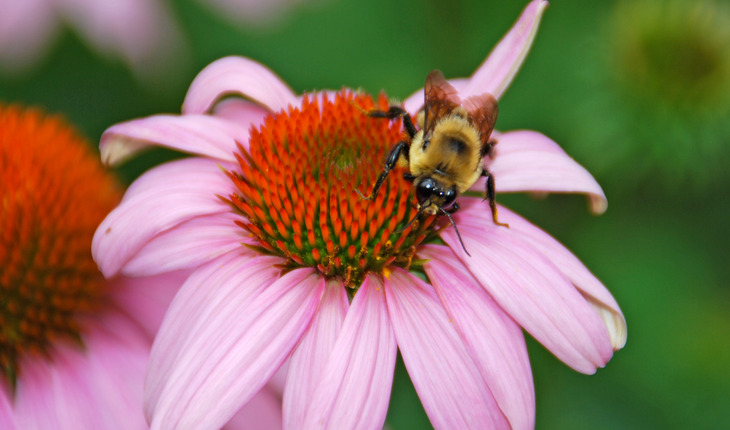 Photo credit: Melinda Myers, LLC, A bee pollinating a coneflower.